Patience and persistence is paying off. Since December 2011, Soccerwidow has published regular match previews and betting recommendations mostly for English Premier League and German Bundesliga 1 games in the German language Betfair blog. For English language readers, Betfair UK, Australia and Ireland uses our previews and bet recommendations but only for Manchester United matches due to a surplus of authors. 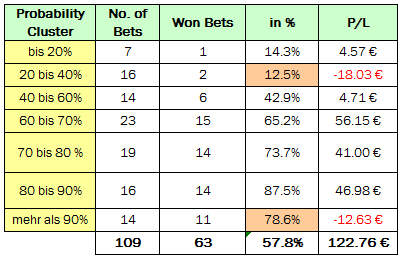 After only 56 bets by the end of February, just three probability clusters (Soccerwidow’s calculations) had hit-rates within the calculated expectations, but a month later, after 109 bets, five of the seven clusters are in line with expected probabilities. 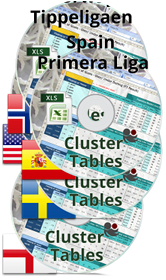 We fully expect that after another 100 bets most, if not all, clusters should be very close to equilibrium. Apologies to all the non-German speakers out there: “bis” means “to” or “up to”, and “mehr als” is “more than”. The next table is a summary of the betting bank. The initial capital of 50 units is now more than trebled and profit amounts to 122.76 units. This corresponds to a 245.5% proportional increase in the size of the bank. Focus on the column P/L per Bet. This column shows an almost constant return per bet which, confirms that the value computations are roughly correct. Firstly, match candidates for betting are sieved through a value filter to ensure a uniform selection process (using our Value Bet Detector Spreadsheet) and afterwards, each bet is individually evaluated before a final selection process is performed. The initial bank of 50 units has rolled-over 38 times and total stakes (risk) adds up to 824.96 units. 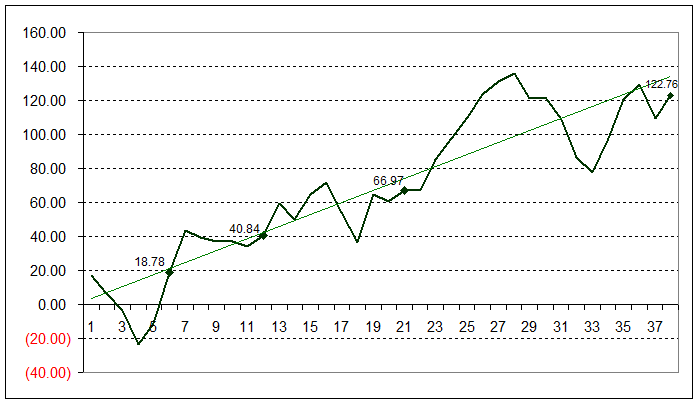 The net profit of 122.76 units corresponds to 14.9% of the total stake (ROI – return of investment). Nice work if you can get it!